According to the product website, the new Answer 2008 lineup of women's and girls' race gear is endorsed by none other than Tarah Gieger, an obvious frontrunner in women's motocross. This stylish Leather Vest by River Road evokes a classic look. The black, full-grain, imported leather provides a soft, luxurious feel and time-honored image. While the leather gives you the quality you want, the nylon stitching and strong solid snaps provide the durability you need. 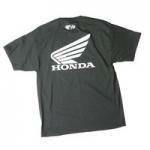 Show your Honda pride with this casual t-shirt from Joe Rocket. Excellently crafted, heavyweight cotton blend is all that goes into this great shirt. That is until you. The short sleeves keep you cool out on the track, or wherever you are. The Fox Racing Girls Elite Jersey is a snazzy outfit which is available in several different colors, perfect if you want to have the "rider" look. 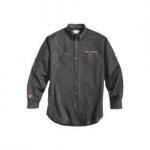 This is a classy button-down shirt that allows the Harley rider to show off their allegiances in an office-casual style. It's one hundred percent cotton, made with a twill texture with a button-down style.